Mattia Bertone first appears in the Painesville, Ohio, area sometime before 1934. In America, Mattia Bertone was known as Martin F. Bertone. Mattia Bertone was born in 1909, at Italy. He married Maria Giuseppina Bertone. 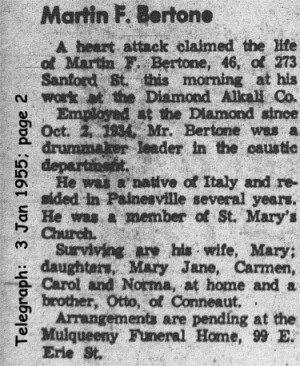 Mattia died on January 3, 1955, at work, at the Diamond Alkali Company, Fairport Harbor, Lake County, Ohio, of a heart attack. His body was interred at Riverside Cemetery at Painesville, Lake County, Ohio. Mr. Bertone was employed by the Diamond Alkali Company from 1934 until his death in 1955. At the time of death, Mattia resided at 273 Sanford Street, Painesville, Lake County, Ohio. Mattia Bertone had a brother, Ottavio Bertone living in Conneaut, Ohio. 1. 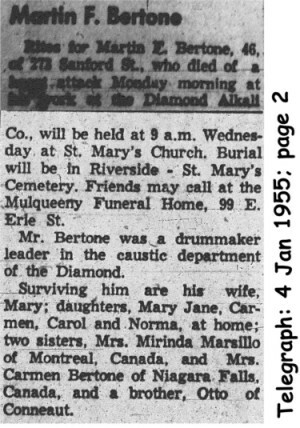 Mary Antoinette Bertone was born on August 28, 1936, at Painesville, Lake County, Ohio. Mary died on January 12, 1937, at 353 North St. Clair Street, Painesville, Lake County, Ohio, from strepocuccus. Her body was interred at Saint Mary Cemetery at Painesville Township, Lake County, Ohio. 2. Mary Jane Bertone was born in 1937, at Ohio. She married Phillip Goblowsky. 3. Carol Bertone was born in 1939, at Ohio. She married Louis Venditti, son of Salvatore Venditti and Bessie Mary Mansueto. 4. Carmen Jean Bertone was born on March 11, 1939, at Ohio. She married Sam Tuma. Carmen Jean died on December 12, 2008, at age 69. Her body was interred at Holy Cross Cemetery at Cleveland, Cuyahoga County, Ohio. 5. Norma J. Bertone was born on June 14, 1947. She married James Sutter.